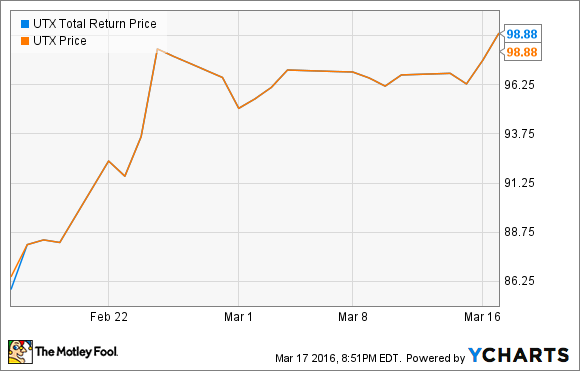 United Technologies Is Up $10 Since February; Is It Still a Buy? A big rebound may have wrung much of the value out of what was once a bargain-priced stock. A big buyout offer helped boost United Technologies stock last month. But can it go higher? UTX Total Return Price data by YCharts. United Technologies headed into the month hampered by worries that sales growth was flatlining, forex headwinds accelerating, and the Sikorsky business gone -- sold to Lockheed Martin, and all its backlog gone with it. And yet, when news leaked that Honeywell wanted to buy the company, sentiment on UTC reversed in a heartbeat, sending the stock up as much as 11%. Within less than two weeks, UTC had rejected Honeywell's offer, and Honeywell, in turn, declined to raise its bid -- and yet UTC stock held on to its new and improved price. At a last-reported price of nearly $99 a share, UTC costs about $10 more than before the buyout offer, despite the fact that the offer is no longer any good. In part, it's because the positives that Honeywell saw in United Technologies stock last month are now plain for everybody else to see -- and reflected in new earnings guidance that UTC released last week. Speaking at his company's annual investor conference, UTC CEO Gregory Hayes reaffirmed UTC's intention to earn $6.30 to $6.60 in adjusted profits this year on sales of $56 billion to $58 billion. Taken at the midpoint, it already implies better revenues than analysts were expecting, and profits at least in the same ballpark as analyst estimates of $6.50 per share. Similarly, in the near term, UTC is looking to deliver between $1.35 and $1.40 in adjusted profits for Q1 this year -- in line with analyst estimates of $1.39. And over the longer term, management says organic sales alone will grow between 5% and 8% annually through 2020. To put hard numbers on those soft estimates, S&P Global Market Intelligence shows that UTC took in $56.1 billion in revenue last year. Five years of 5% to 8% growth therefore implies 2020 revenue of anywhere from $71.6 billion to $82.4 billion. And Wall Street was only looking for $69.2 billion. That's not all. Throw in a bit of extra revenue from potential acquisitions -- Hayes says he "wouldn't be afraid to do a big deal." Then assume profit margins that don't improve at all, but just hold steady. Combine that with better-than-expected revenues, and voila -- there's now every reason to hope that United Technologies will blow away estimates for earnings as well. Best of all, it's starting to look like these will be high-quality profits. In a return to form, Hayes has confirmed that United Technologies will deliver free cash flow equal to "90 to 100 percent" of reported net income, breaking a three-year streak during which FCF numbers came in significantly weaker than reported net income. All of this is very good news indeed. But it does leave investors with the following question: Now that the good news is out, and United Technologies' stock price has leapt $10, is there any more profit left in this stock? Or has all the good news -- today's and tomorrow's alike -- already been priced into the stock? Let's take a look. Priced at 11.5 times earnings today, projected to grow profits at 9% annually during the next five years, and paying a 2.7% dividend yield, United Technology stock looks pretty fairly priced today. Assuming free cash flow basically equal to net income, it would look just as fairly valued when valued on FCF. There are, however, two wild cards to consider. The first is debt -- and UTC has a lot of it. At last report, debt outweighed cash on the balance sheet by more than $13.3 billion. This implies that, as an enterprise, UTC stock costs a whole lot more than it appears to cost, looking at its market capitalization alone. On the other hand, there is also UTC's faster-than-expected revenue prediction to consider. If UTC delivers on its promise to grow revenues 5% to 8% annually, and indeed grows even faster through the addition of new revenue streams from acquired companies, profits growth could swiftly outstrip analysts' predictions of 9% growth. If that happens, UTC shares could begin to look undervalued again. Long story short? I think a lot of the value that I saw in United Technologies shares back in early February did get priced back into the stock during February's rebound. Personally, I don't think it's a huge bargain anymore today. However, if UTC can deliver on its growth predictions, I'd be happy to be proven wrong.